One of Canada’s foremost authors, Margaret Atwood lived here in 1964-1965 while working as a self-described ‘lowly lecturer’ at UBC. “It was a wonderful breakthrough year for me,” she has recalled. “In it, I finished writing The Circle Game and wrote all of the draft of The Edible Woman… The people who gave me the most support were [writer] Jane Rule and [English professor] Helen Sonthoff… I loved the entire year and the only reason I didn’t stay was that I felt I had to go back and complete the work for my Ph.D or I would always be an academic floorscrubber.” Margaret Atwood returned to Ontario and has since published more than forty books. 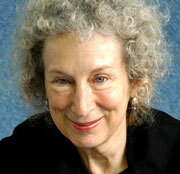 Margaret Atwood was born in Ottawa in 1939. Daughter of an entomologist, she has degrees from the University of Toronto and Radcliffe College, and has also lived in Montreal, Edmonton, Boston, England, Scotland, and France. She has been a full-time writer since 1972. She is married to novelist Graeme Gibson. They were forces in the establishment of the Writers Union of Canada. Atwood was chair of the Union in 1981-82. She was president of PEN Canada in 1985 and 1986. 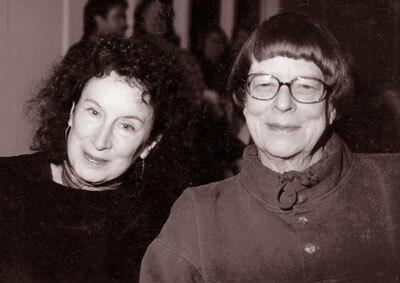 Jane Rule (right) with Margaret Atwood, 2000. To acknowledge the importance of George Woodcock in her career–they had known one another at UBC and he had subsequently written the first, highly supportive review of her first novel to kickstart her career–Margaret Atwood came to Vancouver to participate in ceremonies to honour him in 1994. That review appeared in a major Toronto newspaper. Atwood also maintained a close and muitually respectful friendship with Jane Rule of Galiano Island, where Atwood read her work for several community benefits. Booker Prize, for The Blind Assassin, 2000. Giller Prize, for Alias Grace, 1996. Sunday Times Award for Literary Excellence, for The Robber Bride, 1994. City of Toronto Book Award, for Cat’s Eye, 1989. Governor General’s Award, for Fiction, for The Handmaid’s Tale, 1986. Governor General’s Award, for Poetry, for The Circle Game, 1966. MARGARET ATWOOD was born in Ottawa in 1939. Her unwavering resolve to hold up new mirrors to present-day society, regardless of how unflattering or unsettling the resultant images are, have made her one of Canada’s most widely recognized and respected writers. Her varied novels are The Edible Woman (1969), Surfacing (1972), Lady Oracle (1976), Life Before Man (1979), Bodily Harm (1981), The Handmaid’s Tale (1985), which was short-listed for the Booker Prize, and her semi-autobiographical Cat’s Eye (1988). Her poetry collections include The Circle Game (1966), The Journals of Susanna Moodie (1970), Power Politics (1973), Selected Poems (1976), Two-Headed Poems (1979) and Selected Poems 11(1986). Short story collections are Dancing Girls (1978) and Bluebeard’s Egg (1983). Her major non-fiction work is Survival: A Thematic Guide to Canadian Literature (1972). Margaret Atwood lives in Toronto. She was interviewed in 1979. T: Did you come from a typical liberal background? ATWOOD: I came from a very isolated background. This is probably the key to some of my writing. I grew up isolated from society in a kind and non-violent family of scientists. When I hit society I was shocked. I’m probably still in a state of culture shock! T: And you always will be? ATWOOD: Probably. Because I was only exposed to a small range of human behaviour, the good side. But the bad side is pretty bad. If you grow up being told, “On Saturdays we burn crosses on people’s lawns,” then you can’t be so easily shocked. You become numb to it. “On Fridays we go down to the corner bar and beat each other up and then we go and kill some Jews or Catholics or blacks or whatever.” You can get hardened to that kind of thing. But I’ve never become hardened. So whatever radicalism I possess comes out of that. T: What’s radical about Life Before Man is that it’s the first Canadian novel I know of that seriously conveys an awareness that the human race can become extinct. Was that a conscious theme while writing the book? ATWOOD: Yes. It’s why the novel is set in the Royal Ontario Museum. And why Lesje is a palaeontologist who studies dinosaurs. T: And why the characters exhibit predatory behaviour? ATWOOD: Absolutely. Not just the character of Elizabeth but also how our society encourages people to be that way. T: Sometimes I wonder if we’re heading into an age of examining ourselves for evil. ATWOOD: Being aware of how awful we can be might be a self-preservation technique. Certainly when you do that it stops you from turning other people into the devil. You’re unlikely to say that everything is the fault of the Germans or any other group you want to use as a scapegoat. T: Our scapegoat in Canada has always been the United States. In your work you are really concerned with dispelling that pretense that Canadians are somehow morally superior. ATWOOD: People can be morally superior when they are in a position of relative powerlessness. For instance, if you’re a woman being victimized then you can afford moral superiority. But once you have power, you have to take responsibility. Some of your decisions may be harmful to others. I think Canada has been able to afford moral superiority because it’s been relatively powerless. I don’t think, and I never have thought, that Canada’s inherently better. In fact, all you have to do is look at its past record. Scratch the country and it’s quite a fascist place. Look at the attitudes to the War Measures Act or the RCMP opening the mail. Canada’s not a goody-goody land of idealists. If we got to a position where we needed some witches to burn, I’m sure we’d find some and burn them. That’s why I find Canada potentially a somewhat scary place. Underneath, we’re not much different from anywhere else. You look at mankind and you see something like Dante’s The Divine Comedy. You see the Inferno at one end with everybody pulling out each other’s fingernails, as in the Amnesty International bulletins. Or you see the Purgatorio, shaped like a mountain, with people climbing up it or sitting still. Up at the top there’s what used to be called Heaven with what used to be called God. Only now we’ve replaced Heaven with a kind of Utopian vision of what humanity could be if only. Fill in the blank. The trouble with real life is once you try to implement Utopia, you end up with the Inferno. You end up pulling out a lot of fingernails from the people who don’t agree with you. That is, as we say, the Human Condition. That was the catch-all phrase when I was in graduate school. Whenever you came to the point at which you didn’t know why things were the way they were, you said that was the Human Condition. T: Do you think it’s our swing back to conservatism that’s going to solidify some standards of morality again? ATWOOD: I don’t know whether it’s a question of standards. It might be more a question of fear. I think a lot of people do things because they’re frightened. In times of stress, or what people think of as times of stress and hardship because of course this country is not in stress and hardship, people are not starving in droves in the street, we’re doing a lot of whining that would be pretty much sneered at in other parts of the world people get frightened. They think they may not be able to get jobs. Or they won’t be able to get the kinds of jobs that they might like to have. Whereas in the early sixties, people didn’t feel like that. So now we’re retreating back into our rabbit holes. We’re pulling in our tentacles so they don’t get stepped on. When that happens, you want to form a monogamous relationship with somebody, hoping that it’s going to keep you warm and safe. T: This runs all through your work. The idea that fear is more primordial than love. ATWOOD: Yes. Because in a society like ours where people are pretty much out there on their own hook, there’s no real social support system for them, no small tribe or clan or integrated structure that’s going to support an individual in it; so fear is a real motivating factor. And because you don’t really know where the danger is coming from, fear takes the form often of a generalized anxiety or paranoia. You don’t know who the enemy is. You don’t know what direction you’ll be attacked from. So everybody ends up constantly swivelling around, looking for the next threat. People are afraid of whatever’s out there. And rightly so. T: And that influences who you love and how you love them. ATWOOD: Yes. Are you loving someone out of desperation and need or are you loving someone because they’re “them,” as we say? But now marriage is retrenching itself. People are getting married a lot younger again because in times of economic hardship, people retreat to the domestic burrow. But perhaps these marriages will be formed on more equitable terms. One hopes, with marriage nowadays that people are going into it with different expectations. In 1955, the husband was the breadwinner and the wife would have children; the husband was the boss and the wife kept her mouth shut. I’d like to think that some of that has changed. T: I think maybe one of the problems now is that people may be getting married without enough expectations. T: We’re together and if it doesn’t work out we can always drift off somewhere else. ATWOOD: None of this stuff would make much difference if it weren’t influencing the lives of children. Society has always said, “You have to preserve marriage for the sake of the children.” I’ve never really bought that one. But on the other hand, when breakups start happening on a large scale, you have to think of the consequences. We may be producing a lot of isolated, self-protective, narcissistic children. T: What do you say to the argument that your books only add to the ennui of the present? That bleakness begets bleakness? ATWOOD: That’s like saying everybody should write happy books. As far as I can tell, people in a crisis would much rather have that crisis admitted. When a friend of mine was dying, everybody tried to jolly him up. They said, “Oh no, you’re not going to die.” The fact was he knew he was dying and he wanted to talk about it. I think people in a crisis would rather have somebody say, “This is a crisis, this is real.” That’s much more comforting than saying here are john and Mary, they live in this bungalow, they have a washing machine and three kids, and they’re really happy. What could be less cheerful if you’re in a bad situation than being told normal people are happy? A lot of normal people aren’t happy. T: I agree. People always talk about censorship from the government or censorship through economics. But the main form of censorship in our society is really self-censorship. ATWOOD: Exactly. People will say, “I don’t want to hear about it” or “I don’t want to read about it.” But for me the novel is a social vehicle. it reflects society. Serious writers these days don’t write uplifting books because what they see around them is not uplifting. It would be hypocritical to say the world is inspirational. It’s not. These days the world is a pretty dismal place. You can blank that out. You can destroy your Amnesty International newsletter without reading it. But that doesn’t make that stuff go away. The less you pay attention to it, the more it’s going to be there for somebody else. We think we can go on playing with our toys forever. But if you’re not aware of the fact that you may die, you’re much less careful about other people. One of the crucial moments in any life is when you come to that realization. T: When did you come to that realization for yourself? T: Do you think it was essential to you as a writer to come to terms with death? ATWOOD: It’s essential to everyone as a human being. T: But there’s always been this particularly strong awareness in your poetry that life is transient. ATWOOD: Life is transient. War is hell. T: Do you get sick of hearing critics say your poetry is better than your novels? ATWOOD: People often have difficulty handling somebody who does more than one thing. That’s their problem. It’s not a difficulty for me. ATWOOD: I don’t know whether my poetry is an advantage to me as a novelist or not. For me poetry is where the language is renewed. If poetry vanished, language would become dead. It would become embalmed! People say, “Well, now that you’re writing successful novels I suppose you’ll be giving up poetry.” As if one wrote in order to be successful. The fact is, I would never give up poetry. Poetry might give me up, but that’s another matter. It’s true that poetry doesn’t make money. But it’s the heart of the language. If you think of language as a series of concentric circles, poetry is right in the centre. It’s where precision takes place. It’s where that use of language takes place that can extend a word yet have it be precise. T: Often your novels explore a world that people don’t want to think about or they don’t want to see. Stories that are so modern can frighten people. ATWOOD: Some people are frightened of my work, that’s true. A real kind of heavy shock set in around Power Politics in 1971. But then three or four years after they appear, my books aren’t shocking any more. Because that’s where people have come to. A lot of writers write about their childhood or what it was like in the small town where they grew up. Things that happened twenty years ago. On the pain level, these books are easier to read than something more immediate. When it’s in the past, you know it’s over. But the closer something is to you, the more shock value it can have. It could be you. That’s why some people find me pretty terrifying. They confuse me with the work. T: Also people are still wary of any woman with power. ATWOOD: Yes, but I think more and more, as people get used to the idea that I’m around, some of that fear goes away. I can find there’s more openness now to what I’m doing than there was before. T: Your Survival hypothesis has been rather fiercely attacked as “fashionably radical, bourgeois individualism.” Do you take any of that Marxist criticism seriously? ATWOOD: No, I don’t have very much time for the kind of purist leftism that defines itself as the only true religion. It’s like Plymouth Brethrenism. They’re so puritanical that they don’t even go after new members. They’re just interested in defining their own purity as opposed to the evil of everybody else. That kind of leftism is useless in this country. It has no sense of its constituency. it doesn’t know how to address them. So if they want to call me names that’s fine, nobody’s listening. I work on a magazine called This Magazine. As far as I’m concerned it’s the best of the small left magazines in Canada. One of the members, Rick Salutin, wrote a piece on Survival as a Marxist book. He was talking about how it had an awareness of historical development, how it took into account its place as a political instrument in that development and how it made a connection between the economy and the culture. T: When you have a nation that is only two or three generations removed from the pioneer experience, is it really possible for us to have had anything other than a literature which is predominantly concerned with survival? ATWOOD: That’s one of the things I’m arguing. Although I don’t think that’s the only determining factor. In Western Canada that pioneer experience may be only two or three generations removed, but in Eastern Canada it’s often eight or nine. So it’s not the whole story. T: The whole story is that our colonial status as a nation has spawned a literature of failure. ATWOOD: No, I said a literature of survival. T: Either way, being victimized politically has created a nation that is lacking in self-respect. ATWOOD: Yes, Canada doesn’t go for the brass ring. T: Since you wrote Survival have you become any more optimistic about Canada’s progression towards attaining self-respect politically? ATWOOD: Culturally, you could say Canada’s doing okay. Writers have a union now and they’re standing up for their rights. We’ve even got a film industry of sorts. But that’s a very small group of people. When you look at the economic situation you can see that things have in fact gotten worse. More of Canada is foreign-owned than when I published that book in 1972. So maybe our burst of culture is only a mushroom that will disappear in three or four years. Our entertainment market may be taken over by bigger interests now that Canada is becoming a more lucrative market. For instance, chain book stores now control over forty percent of the business. If they control sixty percent, they will start dictating what will be published. Publishers will send them their manuscripts first and the chain will say what gets published. They will have a stranglehold on writing, and the market will be even more foreign dominated and junk-dominated. This is not optimism or pessimism. It’s just looking at things that are there.